D.C. Electric delivers high quality residential and commercial electrical services to the Boston Metro-West community. We take pride in the relationships we’ve built with homeowners and local business owners. At D.C. Electric, we listen to our customers, helping them make the best decisions for their lighting and electrical needs—no job is ever too small. D.C. Electric is equipped to manage all of your commercial / industrial requirements from new-build projects to minor electrical installations and repairs. 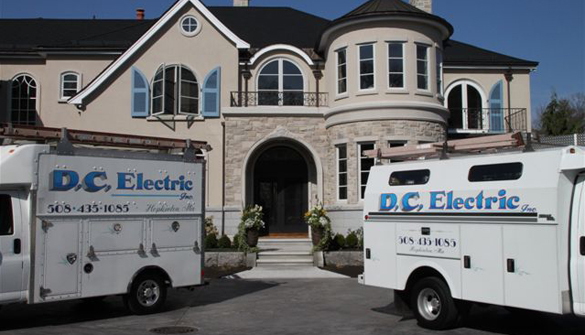 When looking for quality electrical service, look first to D.C. Electric for your residential electrical requirements. Don’t get stuck without heat and electricity. Call us for a free estimate to install your piece of mind. "There is no question in our mind who we call for our electrical services. D.C. Electric responded quickly to our call and minimized our potential downtime."